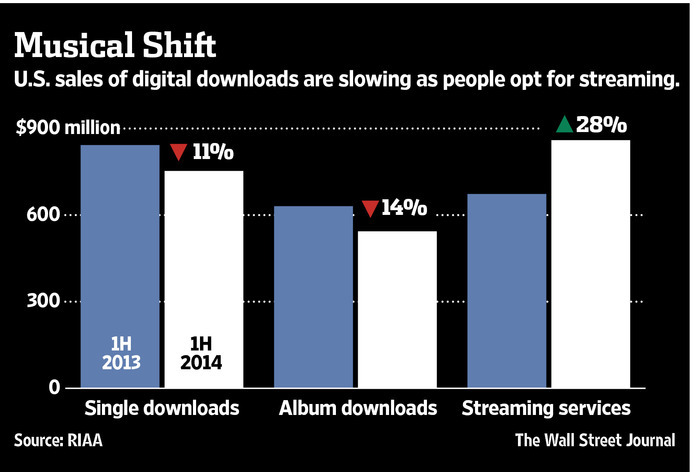 Nielsen Entertainment analyst Dave Bakula chalked up the declines in downloads mostly to “a shift in the way consumers are consuming music,” noting that total streams on services such as Spotify and Pandora Media Inc. were up 46% for the year to date, compared with the same period last year. Streaming services now account for nearly one-third of the revenue from recorded music in the U.S., according to the RIAA. There was note of big albums coming in the next few weeks that might change the percentage a bit, but this is no surprise as we give music away to draw attention and the music streaming services are getting cheaper. (Spotify dropped prices with family plan). Artist need to keep the eye on the ball and remember your live ticket sales, merchandise as well as your overall brand need much attention to keep revenue streams flowing.